“I can look out at your faces and see you had the same reaction I do, which is that that’s an awfully small number.” (60 Trainees) So said American Defense Secretary Ash Carter in testimony before an incredulous Senate Armed Services Committee on July 7, explaining that the $500 million American project, announced over a year ago, to train and arm a new Syrian rebel army to bring the Islamic State to its knees and force a political settlement on the Syrian regime simultaneously has, to date, trained just 60 fighters. It’s been 53 months since the Syrian uprising started, 48 months since President Obama called for regime change in Syria, 29 months since the Islamic State took over northeast Syria, 14 months since they took over northwest Iraq, and 11 months since Obama promised to destroy them, and the entirety of the U.S.’ publicly-announced ground strategy to dislodge the Islamic State from Syria and end the war there is embodied in five dozen “trained” Syrians in Turkey somewhere. The weeks following Carter’s testimony would bring no more reassurance. On July 29, reports emerged that Jabhat al-Nusra, al Qaeda’s Syria affiliate, had captured a group of fighters from Division 30, a rebel group U.S. officials had earlier claimed was among those participating in the train-and-equip program. What would happen when the U.S.’ chief nemesis crossed the U.S.’ handpicked fighters? Division 30 responded by issuing a statement asking its “brothers” in JAN to release the fighters for the sake of the opposition’s “unity” and refused to fight JAN. The extent of the Pentagon’s response was to vigorously deny that any of the captured Division 30 fighters were themselves recipients of U.S. training. It’s easy to understand the consternation of the senators at the Carter hearing. How could the U.S. foreign policy establishment possibly be so incompetent? To move beyond incredulity and consternation, we need to put this training project in context. Over four brutal years of civil war, the U.S. has announced a succession of programs to aid “moderate” anti-government fighters in Syria – all similarly modest, even embarrassingly so. 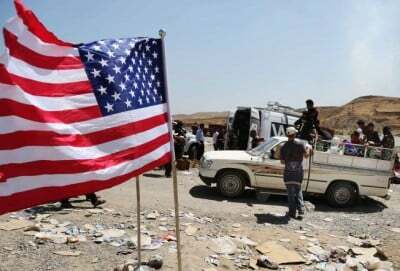 But U.S. rhetoric about these programs has been jumbled and self-contradictory, and has had only the most tenuous connection to events on the ground – and to the true scale of U.S. involvement in Syria. The wide gulf between rhetoric and reality evinces a deliberate public information strategy to conceal the nature of that involvement. Starting in March 2012, a year into the conflict, officials at the White House and the State Department began claiming that the U.S. was directly aiding the Syrian armed opposition with “nonlethal aid,” such as communications gear and medical supplies. The amounts of “nonlethal” aid that the opposition was said to receive were always small. By May 2014, it totaled just $80 million, and included “552,000 MREs, 1,500 medical kits, vehicles, communications equipment, generators, and over three tons of surgical and triage medical supplies.” Spread out over two years and a battlefield the size of Syria’s, these figures are only marginally more impressive than Carter’s 60 trained fighters. In April 2014, after the breakdown of peace talks in Geneva and several months of regime successes in retaking lost ground, U.S. government officials leaked the news that the U.S. had provided rebels in Syria with twelve 20-year-old antitank missile launchers – news that was given exhaustive coverage by the Post, the Wall Street Journal, USA Today, the Brookings Institute and the Foundation for the Defense of the Democracies, among others. With so much contradictory information, it is little wonder that confusion reigned on this point, not only among the general public, but among American media organs and policymakers. Thus, after the fall of Mosul, the New York Times claimed that the city’s fall had increased “scrutiny” on “the decision by the Obama administration not to arm moderate Syrian rebels at the outset,” and Hillary Clinton was quick to note that she “pushed very hard” for arming moderate rebels. This past June, outgoing Daily Show host Jon Stewart ruthlessly mocked various Republican figures for proposing arming rebels in Syria, and implicitly praised Obama for not doing so. In criticizing the current nuclear deal with Iran, the Wall Street Journal recently editorialized, “The U.S. could have armed the Free Syrian Army to defeat Iran’s allied Assad regime in Damascus” to get a better deal. These statements reveal the widely-held assumption that the U.S. has avoided engagement in the Syria conflict, but these statements can only exist in blissful denial of publicly-available information about the reality of the U.S.’ role in Syria since 2011. All such numbers have to be taken with a grain of salt, but the scale of Syria’s insurgency makes the figure credible. These reports of U.S. involvement in facilitating the arming of the opposition have never been refuted, or even denied. They are simply ignored, and lost in the confusion created by the landslide of contradictory public statements. The fact that leading newspapers and public figures now reprimand the Obama administration for not arming the rebels demonstrates the success of this apparent public information strategy. This history should inform how we view U.S. government claims about its current doings in Syria. In the public eye, at least, the effort to aid existing opposition groups in Syria has been replaced by a plan to create a new Syrian rebel army from scratch, training and equipping them in a neighboring country. But all the evidence suggests that this effort is no more serious, and no more central to the U.S.’ real plans in Syria, than the “nonlethal aid” program that consumed so much attention and public debate while American intelligence, with American regional allies, was organizing massive arms shipments to the opposition. If this program were truly central to the U.S.’ Syria strategy, it is difficult to believe that this level of delay and recruitment failure – and now, attacks from Jabhat al-Nusra – would be tolerated. No doubt the military and intelligence officers tasked with its implementation are working sincerely. But for the U.S. foreign policy establishment as a whole, this program likely serves the same purposes as the State Department’s 2012-2014 initiatives to deliver MREs, radios and med kits to fighters in Syria: to demonstrate that the U.S. is involved, to create a public impression of an involvement so limited that it does not saddle the U.S. with any responsibility for the human catastrophe in Syria, and to consume media and legislative branch attention that might otherwise be directed at the main activities of the U.S. and its allies in Syria. While this new training program spins its wheels, events on the ground in Syria are moving rapidly. Following the death of King Abdullah, Saudi Arabia, Qatar and Turkey have set aside their former squabbles and are cooperating in a renewed push to overthrow the Assad regime. This cooperation is manifest in a new rebel alliance, the Jaysh al-Fatih, led by al Qaeda’s Syria affiliate Jabhat al-Nusra. If U.S.’ actions during the first three years of the conflict are any guide, this new joint initiative was not organized without American input or support. Jaysh al-Fatih may be contributing to the U.S.’s stated goal of regime change in Syria. It may be contributing to an unstated U.S. goal of continuing a war that is very costly for Iran, on whose compliance with the U.S.-brokered nuclear agreement a great deal now rests. Jaysh al-Fatih may now be seen as a crucial counterweight to the Islamic State. It would be irresponsible to assign motivations to the U.S. policymakers from the outside, but unless they have had a recent change of heart, Jaysh al-Fatih’s al Qaeda links and its human rights violations (includingviolence against Christians and Nusra’s threat to forcibly convert Alawis) are unlikely to be an overriding concern for them. As the Brookings Institute’s Charles Lister writes, “The vast majority of the Syrian insurgency has coordinated closely with Al-Qaeda since mid-2012,” and the U.S. was helping to arm the Syrian insurgency since early 2012. It has been necessary throughout the conflict, however, for the U.S. to distance itself from these troubling facts, by conveying the impression that its involvement in the conflict is limited to “nonlethal aid” – or, since last June, a small training program in Turkey. Why does the U.S. only have sixty fighters to show for its $500 million, year-old training program? Because it reinforces the narrative – nurtured by a raft of previous hopelessly inadequate, publicly-announced and -debated programs to support the opposition – of the U.S. as a helpless bystander to the killing in Syria, and of President Obama as a prudent statesman reluctant to get involved. While the Senate berates the Pentagon chief over the program’s poor results, the U.S. is meanwhile outsourcing the real fight in Syria to allies with no qualms about supporting al Qaeda against their geopolitical opponents – unless the U.S. is, as before, cooperating directly or indirectly in that support. Once it is recognized that the “helpless bystander” narrative is false, and that the U.S. has been deeply involved in the armed conflict almost from the start, it becomes both possible and necessary to question that involvement. The U.S.’ direct cooperation with Turkey and Gulf states in arming the Syrian insurgency, combined with its refusal to engage in sincere peace talks (as expertly detailed by Hugh Roberts in The London Review of Books), virtually guaranteed that the war would continue without conclusion. The present crisis – 200,000 dead, over half the population driven from their homes, much crucial infrastructure destroyed and Syria’s territory fractured into multiple de facto statelets that will probably never reunify – is the result. Considering the Syrian people’s welfare, it is difficult to imagine a worse policy outcome. A refusal early-on to interfere in the conflict or countenance regional allies’ cooperation with extremist groups, or a genuine attempt at peace talks later in the conflict, or a full-fledged humanitarian intervention of the sort requested by many opposition figures – almost any policy alternative would have been better. At this stage, it may well be too late to save Syria, but if U.S. policymakers want to try, a good place to start would be to make ending the violence – without preconditions and without regard for their preferred political outcome – the overriding objective in U.S. diplomacy and covert action. In a multi-religious country like Syria, that must entail restraining the ambitions of openly sectarian militant groups like Jaysh al-Fatih. It will mean walking away from a publicly-declared commitment to regime change in Syria. It will likely also mean straining relations with regional allies already discomfited by the nuclear pact with Iran. But to end the conflict, the policies and positions that have been perpetuating it must be changed.